Michon Martinez is a Las Vegas native. As early as elementary school Michon has been involved in drawing and painting. She took private art classes as a teenager and has continued drawing into her adult years. Michon has taken her artistic eye into photography. For the past few years she has been working as a professional photographer for a prominent Las Vegas Strip Property. Her ability to recognize and appreciate qualities that would typically go unnoticed by the casual observer has enhanced her photographic skills. Michon has always been persistent in perfecting her artistic flair. Bold compositions, high sense of color, extensive drawing utilizing different mediums has helped her practice and master techniques. Michon has always enjoyed developing her talents which has allowed her to cultivate an artistic appreciation. Michon attended Euphoria Institute for Beauty. After graduating at the top of her Aesthetics class as valedictorian, she is now a licensed Aesthetician. Her passion for tattooing and ink led her to train and apprentice with the world renowned permanent make-up artist Teryn Darling! 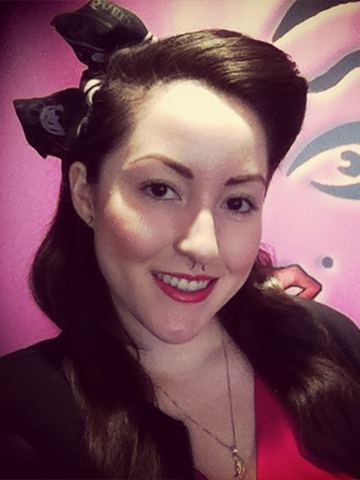 Michon Martinez can now be found at Girlz Ink in Las Vegas, Nevada, where she specializes in permanent make-up.